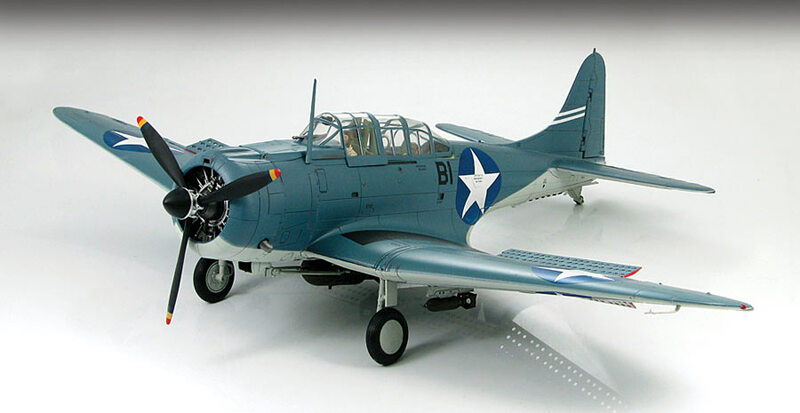 Hobby Master Douglas SBD-3 Dauntless USN VB-6, Die Cast Model Airplane. This Limited Edition model is part of Hobby Master’s top-of-the-line Premium Collection. Limited Edition of 500 pieces. Exceptional features include a fully outfitted cockpit with a sliding canopy and realistic crew figures, an engine cowling that removes to reveal a finely detailed radial engine, two wing-mounted 100-pound bombs and a movable bomb crutch with a 1,000-pound bomb, a movable rear .30 caliber machine gun, working dive brakes and retractable landing gear, a rotating metal propeller, an authentic VB-6 paint scheme. This entry was posted in Hobbies and Toys and tagged aircraft replicas, airplane models, Collectibles, diecast model airplanes, Hobbies and Toys. Bookmark the permalink.